You can’t win them all. Tonight’s 1-1 draw at Las Palmas was only the sixth time that FC Barcelona have dropped points this Liga season and means that Atlético Madrid, who thumped Leganés 4-0 the day before, move to within five points of the Catalans ahead of Sunday’s top-the-table showdown at Camp Nou. Barça remain unbeaten after 26 games, but were expecting for something more out of this midweek trip to the Canary Islands. Indeed, rather than rotate with Atlético in mind, Ernesto Valverde fielded about as strong a team as he could have. But they were unable to get the three points, and that was despite the night getting off to the most promising of starts. 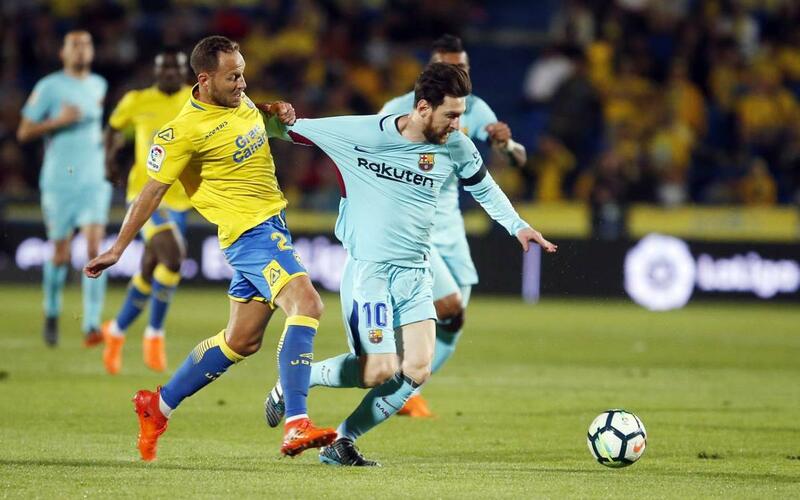 Lionel Messi had been to the Estadio de Gran Canaria twice before without scoring, but it took him just twenty minutes to set that record straight. And it was classic Messi. His banana-style free kick spun wondrously around the wall and way beyond the reach of his compatriot Leandro Chichizola in the Las Palmas goal, who was the main reason why Barça hadn’t already taken the lead earlier. But all credit to Las Palmas. Although Barça continued to dominate, there wasn’t too much in the way of clear-cut chances as the half progressed, and they did manage the occasional pop of their own – though nothing to truly trouble Ter Stegen. The talking point of the first half came right at the close when Chichizola clearly handled the ball outside the area – the kind of thing that can often see red cards being brandished. Not this time. The referee adjudged it to have been accidental and left it at that. Well, it wasn’t at all clear what the penalty was given for. Sergi Roberto on Matías Aguirregaray, maybe? A Lucas Digne handball? Amid somewhat confused scenes, Jonathan Calleri accepted the referee’s gift and the teams were back on level terms. The goal brought Las Palmas to life. Belying their precarious position at the wrong end of the league table, for spells they almost looked the more dangerous side. Barça were drawn into frustration and uncharacteristic errors as they searched for the flashes of magic that we’re so used to seeing, but that tonight just didn’t want to come. The home side drew further and further back into defence, and did so very solidly, while Ousmane Dembélé was sent on to see if he could spark some late drama for Barça. But no. The game fizzled out and came as a stark reminder that despite the runaway lead, this Liga campaign is far from over.